Remember when kale was only used as a garnish with an orange slice on your favorite plated food? Or even used to decorate a salad bar? Kale has come a long was in the whole foods movement. During the Middle Ages, kale was one of the most common green vegetables in Europe, as it was easy to farm. During World War II, the farming of kale in England was encouraged by the Dig for Victory campaign. The leafy green vegetable was easy to grow and provided important nutrients to supplement those missing from a normal diet because of rationing (DailyMail). The author of Taylor’s Guide to Heirloom Vegetables, Benjamin Watso writes that Kale and collard greens freezes well and tastes sweeter and more flavorful after being exposed to a frost. Two servings a week of kale or any of its cruciferous vegetable cousins can help prevent cancer. The different colors of kale can range from green, light green, dark green, and violet-green to violet-brown. 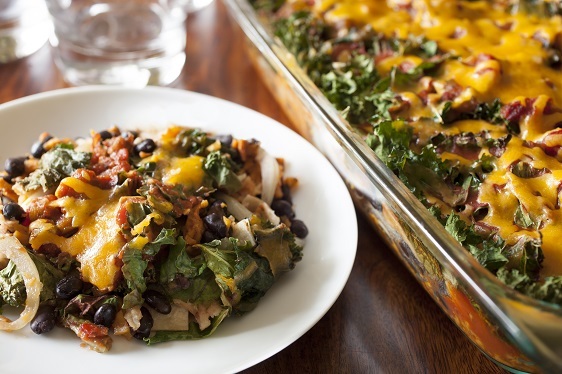 If all of this has your saliva moving, then let’s move on to our featured recipe: Enchilada Casserole with Kale and Sweet Potatoes, and here is what you will need. This entry was posted in Beef, Chicken, Main Dish, Side Dish, Vegan and tagged Benjamin Watso, Casserole, dinner, enchilada, Enchilada Casserole, green vegetables, healthy dinner, Kale, Kale Recipes, leafy green vegetable, Lunch, Mexican, Olive oil, shredded cheese, Side dish, simple, Sweet potato, sweet potatoes, Vegan, vegetarian. Bookmark the permalink. Have a great Sunday and week ahead!! WOW – This sounds like an interesting combo!